What features distinguish a sacred image from a secular one? LMU art historian Chiara Franceschini studies how contested theological concepts found their visual expression in the art of Early Modern Europe. 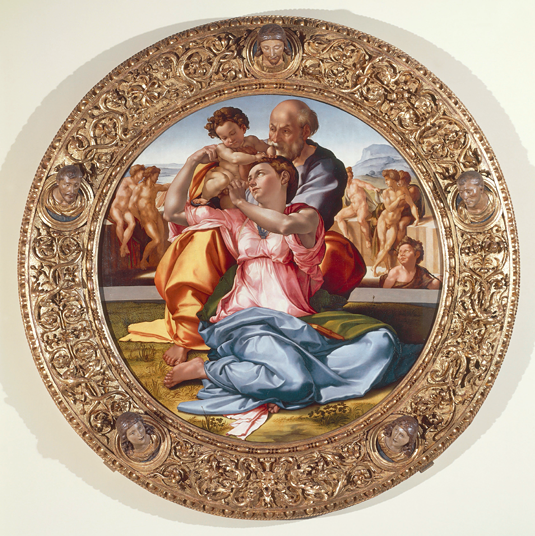 Commissioned for the bedchamber: Michelangelo‘s Doni Tondo was intended to reassure its sponsors that their unbaptized children had not been condemned to eternal torment. It all began with a gaping wound – a deep fissure in the breast. The work caused a scandal: Roman high society, although well accustomed to the monumental realism of the Renaissance and the Post-Renaissance, was shocked by the hyper-expressive – and very bloody – works of a minor master from Sicily. Not content with the canonical five wounds of Christ on the Cross and inspired by the fervor that was such a feature of the Counter-Reformation, the sculptor and wood-carver Innocenzo da Petralia had added a sixth gash. The Roman Inquisition reacted to this ‘transgression’ by opening an investigation, and tried to bring the artist – a member of the Franciscan Order – to trial. “If Innocenzo da Petralia had only remained in Sicily, nothing would have happened to him,” says Chiara Franceschini, Professor of Art History at LMU. “The Sicilian public was perfectly familiar with such lurid depictions of the Crucifixion. The artist‘s traditional Sicilian style was found to overstep the bounds of propriety only he began to work in Central Italy.” This incident reveals that notions of what a sacred image should look like varied from region to region, and this insight was the initial trigger for Franceschini’s project SACRIMA. The project won her one of the generously endowed Starting Grants awarded to young researchers by the European Research Council (ERC), and this in turn brought her a tenure-track professorship at LMU, where she and her group are now exploring “The Normativity of Sacred Images in Early Modern Europe”. What exactly was it about Petralia’s Crucifixion that upset people? Was it the well-nigh obscene delight with which he depicts the bruised and ill-used body? Or the liberties he takes with conventional theology in inflicting a sixth wound on the crucified Christ? Or perhaps both? Petralia’s crucifixes provide a striking instance of how contesting and contested theological and esthetic concepts could become entwined in Counter-Reformation Europe. “The conflict also reflects a clash between the prevailing medieval cast of mind and emerging early modern modes of thought at the dawning of the Renaissance,” Franceschini explains. But this collision was artistically very productive, as Franceschini (herself a native of Tuscany) illustrates, using as an example Michelangelo’s “Doni Tondo”, a panel painting that was probably painted in 1506 and is now in the Uffizi Gallery in Florence. The word tondo refers to the painting’s circular format, and the “Doni Tondo” depicts the Virgin Mary, the Christ Child, John the Baptist and – in the background, beyond a kind of trench – five naked youths. This rather flippant combination has given rise to a wide variety of interpretations. But none of them really provides a convincing resolution of the apparent conflict between esthetics and theology that the image seems to evoke. “One important factor,” as Franceschini explains, is the context for which the work was originally intended. For the picture was commissioned by the wealthy Florentine cloth merchant Agnolo Doni and his wife Maddalena, née Strozzi – and was intended for the couple’s bedchamber. At the time of the commissioned, Maddalena had already borne several children, but all had died before they could be baptized. In the 16th century, this meant that, in addition to the suffering caused by these tragic losses, the grieving parents were left with nagging doubts as to the fate of their children in the next world. In the early 5th century, Saint Augustine had declared that baptism was an essential prerequisite for the remission of original sin, and the Synod of Carthage in 418 came up with the idea that the souls of innocent children who died unbaptized inhabited a kind of Ante-Hell called Limbo. The notion was never recognized as canonical, but aroused great controversy in the time when the ascetic monk Savonarola dominated Florence, and later during the Reformation. Among other interventions, the Archbishop of Florence Antonino Pierrozzi (1389 – 1459) had asserted that those confined to Limbo suffered no torments and that all unbaptized boys would be resurrected as 33-year-old men (the age at which Jesus had been crucified). And indeed, as Franceschini points out, the youths in Michelangelo’s picture – who can be equated with the Doni children – are depicted in a state of nature, in a realm that is clearly separated from that reserved for the baptized and the (potentially) saved. The remarkable circular frame supplies a further clue. It is decorated with five heads, carved in the round. The one at the top – which would have been visible from the Donis’ marriage bed – probably represents Jesus, who presides over salvation history. “Much of Renaissance art is difficult to separate from its cultic function. Here, the theological inspiration focuses on the notion of resurrection, which is Michelangelo’s central concern.” The point at issue is how esthetic and theological considerations interact. This would also explain why the subject of the Doni Tondo had so few imitators and soon went out of fashion – the theological background had irrevocably changed, in part as a result of the Reformation. “The Reformation saw dramatic upheavals in both theology and esthetics. The interconnections between these developments have been extensively investigated in regions that adopted Protestantism,” Franceschini explains. However, in predominantly Catholic areas, such as Italy, Spain, France, the Netherlands and Southern Germany, much remains to be done in this respect. Franceschini‘s SACRIMA project represents an attempt to fill this gap by taking the geographical context into account. The complexity of these interactions is demonstrated by the history of the 1511 altarpiece “Madonna and Child” painted by the Florentine artists Fra Bartolomeo and Mariotto Albertinelli. The work was commissioned by Ferry Carondelet, a Catholic priest and diplomat in the service of the Habsburgs, and is now in Besançon Cathedral. This image also features five naked young men in a landscape beyond an open door, and John the Baptist, who gestures toward them. The scene is framed by the saints Sebastian, Anthony and Stephen, and by Carondelet himself, and dominated by Mary and the Christ Child, accompanied by putti. The theme is once again, “the salvation of the unbaptized”. But this time the reference is not only to innocent children, but also to those who could never have been baptized – the whole of humanity before the birth of Christ, and the Indians who had been discovered less than 20 years before the painting was made. Carondelet belonged to a prominent French family and, while studying in Rome in 1509, he had befriended Erasmus of Rotterdam, who was then a well known and highly influential theologian and humanist. Erasmus had already begun to think about the problem of the salvation of the unbaptized, and this would culminate in his edition of a short tract entitled De Gratia written by Bishop Faustus of Riez in 460. The new edition of this tract, with a short introduction by Erasmus, appeared during a period marked by vehement theological disputes between the Roman Curia and the Reform movement. Erasmus declined to take either side. Instead, he flatly rejected “all forms of dogmatic certainty,” says Franceschini. Like his patron St. Augustine, Luther (a former Augustinian monk) regarded baptism as indispensable for salvation. Moreover, he had adopted the doctrine of predestination, which Augustine had also wrestled with. Indeed, Luther maintained that the fate of every individual soul had been arbitrarily decided by God before the beginning of time. Erasmus took a very different view, and emphasized the role of free will and the ability to decide between good and evil. However, the fact that he based his arguments on the writings of Faustus von Riez was not without risk. For the Second Synod of Orange in 529 had reaffirmed Augustine’s theology, and declared the views of Bishop Faustus to be heretical. For Franceschini, the relationship between Ferry Carondolet and Erasmus throws new light on the significance of the youths depicted on the altarpiece in Besançon. It suggests that the decision to include them was not made by the artists, but by their client, and was intended to underline Carondolet’s support for the theological positions on free will and original sin espoused by his friend Erasmus. The painting therefore contends that those who never had an opportunity to be christened – whether new-born infants or pagans ancient and modern – could nevertheless partake of the mercy of God. Innocenzo da Petralia, Michelangelo, Fra Bartolomeo: These examples illustrate the multidimensional nature of theological and esthetic debates in the turbulent years of the Reformation and Counter-Reformation. In the 15th and 16th centuries, art and religion became involved in a complex form of shadow-boxing, whose regional manifestations influenced and stimulated one another. Many of these interactions resulted in fruitful advances. But in other cases, the rival positions were so far apart that no reconciliation was possible, and only the scars have remained. Prof. Dr. Chiara Franceschini Professor of Early Modern Art History at LMU. Franceschini, born in 1973, studied Archaeology, Art History and History at the Scuola Normale Superiore in Pisa (where she obtained her Ph.D. in 2008), and at the European University in Florence. Following a spell as postdoc at London University‘s Warburg Institute she held a teaching position at University College London. Having won an ERC Starting Grant, she moved to LMU in 2016.